The BM-21 “Grad” (Russian: БМ-21 “Град”), is a Soviet truck-mounted 122 mm multiple rocket launcher, and a M-21OF rocket were developed in the early 1960s. BM stands for boyevaya mashina (combat vehicle), and the nickname grad means “hail”. The complete system with the BM-21 launch vehicle and the M-21OF rocket is designated as the M-21 field rocket system. The complete system is more commonly known as a Grad multiple rocket launcher system. In NATO countries, the system (either the complete system or the launch vehicle only) was initially known as M1964. Several other countries have copied it or developed similar systems. The M-21 field rocket system with a BM-21 launch vehicle (122 mm multiple rocket launcher (MRL) system entered service with the Soviet Army in 1963 to replace the aging 140 mm BM-14 system). The launch vehicle consists of a Ural-375D six-by-six truck chassis fitted with a bank of 40 launch tubes arranged in a rectangular shape that can be turned away from the unprotected cab. The vehicle is powered by a water-cooled V-8 180 hp gasoline engine, has a maximum road speed of 75 km/h (47 mph), road range of up to 750 kilometers (470 mi), and can cross fords up to 1.5 m (4 ft 11 in) deep. The original vehicle together with supporting equipment (including the re-supply truck 9T254 with 60 rockets) is referred to by the GRAU index “9K51”; the launcher itself has the industrial index of “2B5”. In 1976, the BM-21 was mounted on the newer Ural-4320 six-by-six army truck. The three-member crew can emplace the system and have it ready to fire in three minutes. The crew can fire the rockets from the cab or from a trigger at the end of a 64-meter (210 ft) cable. All 40 rockets can be away in as little as 20 seconds, but can also be fired individually or in small groups in several-second intervals. A PG-1M panoramic telescope with K-1 collimator can be used for sighting. The BM-21 can be packed up and ready to move in two minutes, which can be necessary when engaged by counter-battery fire. Reloading is done manually and takes about 10 minutes. Each 2.87-meter (9 ft 5 in) rocket is slowly spun by rifling in its tube as it exits, which along with its primary fin stabilization keeps it on course. Rockets armed with high explosive-fragmentation, incendiary, or chemical warheads can be fired 20 kilometers (12 mi). Newer high explosive and cargo (used to deliver anti-personnel or antitank mines) rockets have a range of 30 kilometers (19 mi) and more. Warheads weigh around 20 kilograms (44 lb), depending on the type. The number of rockets that each vehicle is able to quickly bring to bear on an enemy target makes it effective, especially at shorter ranges. One battalion of eighteen launchers is able to deliver 720 rockets in a single volley. The system has lower precision than typical artillery and cannot be used in situations that call for pinpoint precision. It relies on a large number of shells dissipating over an area for a certain hit rate on specific targets. Nonetheless, because of the short warning time for the impact of the whole volley, the BM-21 is still considered an effective weapon. BM-21: Original version known as the BM-21 launch vehicle. The launcher unit was mounted on a modified Ural-375D truck chassis.BM-21-1: Launch vehicles are mounted on a family of Ural-4320 truck chassis. 2B17 or also BM-21-1: This upgrade was presented for the first time in 2003 and was developed by Motovilikha Plants from Perm. The system is fitted with a satellite navigation system NAP SNS, automated fire control system ASUNO, APP laying system and can fire a new generation of rockets with a range of 40 km (25 mi). The truck is the Ural-43201. 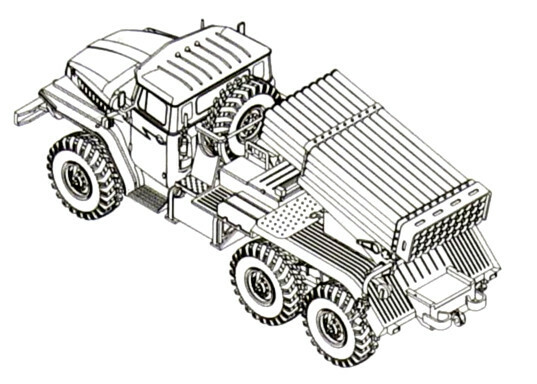 9P138 “Grad-1”: lighter 36-round version, mounted on a six-by-six ZIL-131 chassis. The vehicle with supporting equipment (rockets, transporter 9T450 and re-supply truck 9F380) is referred to as complex 9K55. 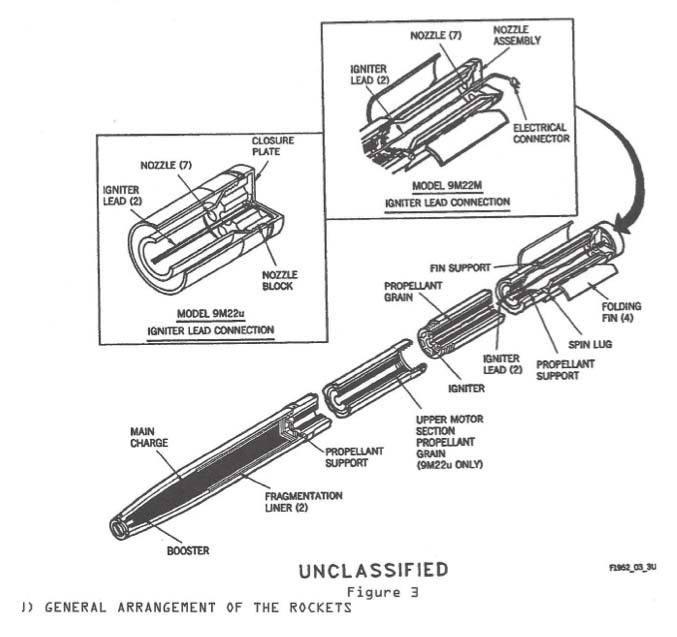 The 9P138 can only use “short-range” rockets with a range of 15 km (9.3 mi). It used to be known in the West as BM-21b or M1976. BM-21V “Grad-V” (Vozdushnodesantiy – ‘airborne’) (NATO designation M1975): Developed for airborne troops in 1969. A GAZ-66B four-by-four truck chassis is fitted with a 12-round 122 mm rocket launcher. The vehicle is sturdy enough to be air-dropped. Parts of the vehicle such as the canvas cab roof can be taken off or folded down to reduce its size during transit. Like the BM-21, the BM-21V has stabilizing jacks on the rear of the vehicle for support when firing. The launch vehicle has the industrial index of 9P125. 9А51 “Prima”: 50-round launcher on a Ural-4320 5t chassis. The vehicle together with fire control equipment, the ammunition transporter TZM 9T232M and the new rocket 9M53F is referred to as complex 9K59. Apparently only a small number was produced. “Grad-P Light portable rocket system”: The complete system comprises a 9P132 single-round man-portable launcher (it can be reloaded and used again), a 9M22M 122 mm high-explosive fragmentation rocket and a fire control panel. The system was developed in the middle of the 1960s for North Vietnamese forces at war with the US. It was not accepted for service with the Russian Army, but it was and is still popular with paramilitary and guerrilla forces. BM-21PD “Damba” (Protivodiversionnyi): 40-round launcher mounted on Ural-375D or 43201 truck chassis. Developed for protection of naval bases against underwater infiltrations, uses special ammunition PRS-60 (Protivodiversionnyi Reaktivnyi Snaryad). The vehicle together with ammunition transporter is referred to as complex DP-62 “Damba”. A-215 “Grad-M” – 22-round naval version, entered service in 1978. Adaptations of the launcher were/are produced by several countries including China, Czechoslovakia, Egypt, Iran, North Korea, Poland and Romania. BM-21A “BelGrad”: This is a modernized version, based on a MAZ-631705 6×6 truck with 425 hp diesel engine TMZ-8424. Between the cab and the launcher there is another pack of 40 rockets. The system was evaluated from 1997 and entered service in 2001. BM-21M “Grad-U”: Ukraine also has switched the original Ural-375 truck with gasoline engine for a new truck with diesel engine, the KrAZ-6322-121. Some vehicles have a longer chassis with 40 additional rockets. RS-122 Magaria: In March 2012, the Republic of Georgia unveiled its own heavily modified self-propelled version of the BM-21 Grad. There are innovative improvements similar to that of its Polish counterpart. The crew cabin is armoured and well protected in accordance to Stanag level 2 or higher. The 40 tube launcher is fitted with a pin point target system and has a maximum firing distance of 45 km depending on ammunition, that guarantees much more precision at greater distances. There is enough room for an additional 40 tube pack. The launcher can be deployed and activated directly from inside the crew cab, so that the time between salvos is heavily decreased. However the traditional external setup is also available. An entire barrage is fired in less than 20 seconds. The general purpose platform can also be used for more sophisticated rocket systems. Type 81 SPRL: The People’s Republic of China produces the Type 81, which was copied from Russian BM-21s captured in the 1979 Sino-Vietnamese War. After reverse engineering, it entered service with the PLA in 1982 where its upgraded version nowadays known as PHZ81. Due to the fact that it is a direct copy, the Type 81 is extremely similar to its Russian predecessor. Its 40 tubes are mounted on a Shaanxi Automobile Works Yan’an SX2150 six-by-six truck, which unlike the original Russian version, has a cab protected by blast shields. Type 83 SPRL: This is a 24-round version, based on a Dong Feng truck. The launch tubes are arranged in three rows of 8. The launch vehicle has a total combat weight of 8,700 kilograms (19,200 lb) and can also be used as part of the mine-laying rocket system Type 84. Currently new rockets with ranges between 30 and 40 km (19 and 25 mi) are being developed. Type 89 TSPRL: This is basically the 40-round launcher of the BM-21 or Type 81 mounted on a tracked chassis with 520 hp diesel engine. The same chassis is also used for the Type 83 152 mm self-propelled howitzer (PLZ83), the Type 89 120 mm tank destroyer (PTZ89) and several other specialised vehicles. The vehicle has a combat weight of 29.9 short tons (27.1 metric tons) and carries 40 spare rockets. Its current PLA designator is PHZ89. Type 90 SPRL: The NORINCO (China North Industries Corporation) Type 90 40-round multiple rocket system is an indigenously designed and built system equipped with an automatic operating and laying system, an electric firing system and an automatically reloadable pack of 40 rockets. It is very similar to the M-77 Oganj but of 122 mm calibre. The chassis used is the Tiema SC2030 6×6 truck. A Type 90 MRL battalion consists of three batteries, each with 6 self-propelled rocket launchers, 6 ammunition re-supply trucks Tiema XC2200 with 80 rockets and a battery command post on a DongFeng EQ-245 6×6 truck. Type 90A: Modernised version, based on a Tiema XC2200 6×6 truck chassis and fitted with a modern fire control system with GPS. The command post vehicle can lay and control a number of Type 90A systems by remote control for maximum firepower. Type 90B: Latest, digitalised version. The rocket launch vehicle is based on a Beifang Benchi 2629 series 6×6 truck (Mercedes-Benz copy) and has a longer cabin. Each set now also has three forward observer vehicles, based on the armoured WZ551. PR50 SPMRL: Development of Type 90B SPMRL with firepower increased by 25% (50 rounds compared to the original 40 rounds). Incorporate features of Weishi series self-propelled multiple rocket launchers (WS SPMRL) series so that the operating cost and overall life cycle cost for both when most components of PR50 is interchangeable with that of WS series. Also incorporated is a feature originated in Type 90B, which is the adoption of rockets of different ranges, so PR50 has a wide range of 20 km to 40 km. WS-6 SPMRL: A light weight and more compact derivative of unguided 122 mm PR50 SPMRL for rapid deployment, with number of tubes reduced by 60% to 40 * from the original 100 of PR50 MLS. RM-70 (122 mm RAKETOMET vz. 70): In 1972 the Czechoslovak Army introduced its own version of the BM-21 launch vehicle, designated the RM-70. The launcher unit comprises a bank of 40 launch tubes arranged in 4 rows of 10 and it is mounted on an eight-by-eight 10-ton modified Tatra T813 truck. Unlike the BM-21, the RM-70 has an armoured cab and enough room behind it to allow for the storage of further 40 rockets. Those rockets can be directly reloaded into launcher at the same time. RM-70/85: Modification of RM-70 launch vehicle on unarmored Tatra T815 truck. WR-40 “Langusta” (eng. European spiny lobster) (wyrzutnia rakietowa means rocket launcher): This is a modern Polish version with a new fire control system (with ballistic computer BFC201 and navigation system Sigma 30) and a modified launcher based on the Jelcz P662D.35G-27 6×6 truck (produced by Jelcz-Komponenty). The first vehicle entered service on March 20, 2007. Probably about half of all 227 Polish BM-21 launchers will be converted into WR-40 launchers. New, modern types of munition were also developed for the launcher: the range is approximately 42 km (26 mi) for fragmentation-HE rockets “Fenix” and 32 km (20 mi) for cargo rockets. The Jelcz P662.D.35 truck with lightly armoured cab is also believed to be the base of a Polish multiple rocket launcher complex, which will possibly be developed in the future. The Egyptians domestically manufacture the rockets Sakr-18 and Sakr-36, with a respective range of 18 km (11 mi) and 36 km (22 mi), and the latest Sakr-45 with a superior range of 45 km (28 mi). Rather than a standard HE-Frag round, the Egyptian military prefers a 23-kilogram (51 lb) cluster munition, which can be extremely effective against lightly armored equipment and troop concentrations. Both rockets, as well as the original Soviet models of course, are fired by locally manufactured rocket launchers like the RL-21 (copy of BM-11) and RC-21 (copy of BM-21, similar to the Hadid HM20). The Helwan Machine Tools Company also produces portable systems with one, three, four and eight launch tubes. Since 2006 Hamas has fired 122 mm Grad rockets, copies made in Iran, and Eastern-bloc versions modified to expand their range and lethality, into Israel. The rockets were believed to be smuggled into the Gaza Strip via tunnels from Egypt. Some of the rockets were of a Chinese Grad variant. Hamas sources said they were pleased by the performance of the Chinese variants of the BM-21 Grad rocket, which demonstrated a far greater range and blast impact than Palestinian-made rockets, as well as Russian-origin Grads or Katyushas. Hamas have used small man-portable single-tube launchers for rockets in attacks against Israel, designated 122 mm 9P132/BM-21-P. The 122 mm Grad rockets used in Gaza have a range of about 40 km (25 mi), and can reach the Israeli towns of Ashdod, Beer-Sheva, Ofakim, Gedera, Kiryat Gat, Ashqelon, Sderot, Rehovot, Kiryat Malachi and Gan Yavne. The Islamic Jihad also published a clip claiming device mounted used as a multi-barrel rocket launcher on vehicle used for first time in Gaza On 7 April 2011, the Iron Dome system successfully intercepted a Grad rocket launched from Gaza for the first time. The rockets were launched without their dedicated platforms and by untrained operators which causes very low accuracy.Over 50% of the rockets miss entire cities and over 10% end up hitting the sea. The Homicho Ammunition Engineering Complex produces the rockets while the Bishoftu Motorization Engineering Complex produces the launching tubes and has converted existing trucks to diesel engine. Bishoftu motorization has also produced a six tube launcher to be mounted on light trucks. BM-11: North Korean 30-tube version. The tubes are arranged in 2 banks of 15; all rockets can be fired in as little as 15 seconds. The basis for the BM-11 system is a Japanese manufactured Isuzu chassis. MRL 122 mm M1977: U.S. DIA code for a system that appears to be a direct copy of the BM-21 “Grad”. D.I.O. from Iran produces copies of the BM-11 and BM-21 systems that can fire the original Soviet rockets as well as the locally developed “Arash” with a range of 20.5 km (12.7 mi). There is also a rocket with a range of 75 km (47 mi). HM20 – This is the Iranian version of the BM-21, mounted on a Mercedes-Benz 2624 6×6 truck. The launch pack however consists of 2 packs of 20 tubes. Reportedly there is also a version with an automatic reload-system, latest version is mounted on 6×6 MAN trucks. HM23 – Lighter 16-round version with two packs of 8 launch tubes. HMxx – Iranian version of the 30-round BM-11, based on a Mercedes-Benz LA 911B 4×4 truck. Some vehicles are equipped with a light hydraulic crane. Various 122mm-type rockets were deployed by Iraq during the Iran-Iraq war, modified to deliver nerve agents to targets. This included the 40 inch long, domestically produced Grad MLRS-compatabile “Borak” warhead designed to disperse sarin gas. KRL 122 – Kahuta Research Laboratories from Pakistan have developed a rocket launcher that is very similar to the North-Korean BM-11. The KRL 122 was originally based on an Isuzu truck but later models use the Reo M35 truck. Some sources mention the designator Gadab. In addition to the original Soviet rockets, the system can launch the “Yarmuk” rocket developed by Pakistan Ordnance Factories. The KRL 122 has achieved a maximum range of over 40 km due to the use of upgraded 122 mm rockets. APR-21 (aruncator de proiectile reactive – rocket launcher): Romanian 21-round launcher (3 rows of 7) mounted on a Bucegi SR-114 four-by-four chassis. No longer used by the Romanian Army but some vehicles have been exported to Nigeria and Croatia. Morocco has the launch pack mounted on a Kaiser M35 truck. APR-40: Initially this designator was used for the original BM-21 “Grad” in Romanian service, but Aerostar SA has developed an improved model, based on a DAC-665T six-by-six truck. A slightly improved model, called APRA-40 or 40 APRA 122 FMC is based on the DAC 15.215 DFAEG truck. Each launcher is normally accompanied by a re-supply truck MITC with a 6t crane and a trailer RM13. The system is also used by Botswana, Bosnia, Cameroon, Croatia, Iran, Iraq, Liberia and Nigeria. LAROM or LAROM 160: This is an upgraded version that was developed in cooperation with Israel. The launch vehicle is based on the truck chassis DAC 25.360 DFAEG, fitted with two launch packs with each 20 122 mm tubes or 13 160 mm tubes. The LAROM 160 can fire rockets like the LAR Mk.IV with a range of 45 km (28 mi). The system entered service with the Romanian Land Forces in 2002. LRSVM Morava: Universal modular MLRS with possibilities to use all models of Grad 122 mm rockets, both with M-77 Oganj and M-63 Plamen 128 mm rockets too. G-2000: Produced by EdePro, G-2000 122 mm missile is with range above 40 km. Valkiri: This is an improved South African design by Denel using 127 mm rockets. Bateleur: A newer, more accurate version of the Valkiri. Based on the Withings (White Stallion) military recovery truck chassis. Also produced by Denel. DTI-2:The 122 mm Multiple rocket launcher by Defense Technology Institute. The original “GRAD” rocket has a range of about 20 kilometers (12 mi). The first modification called “G-M” increased the range to about 27.5 kilometers (17.1 mi), while the second modification “G-2000” further increased the range to about 40 kilometers (25 mi). The range may also vary due to the type of warhead. Also Incendiary, Chemical, Illumination, Antipersonnel mines. Finland: 24 units, known as 122 RAKH 76. Now withdrawn from service. France: 3 units, found by French forces during Operation Serval, probably of Libyan origin.